Blogs like Carp On The Fly and Fly-Carpin can give the false impression that catching carp is easy. In the Triangle that can't be farther from the truth. My buddy Shea shares his experience. I hope you enjoy it. I think it's something most of us carper wannabes can relate to. Many of us don't give much thought to where the water comes from as we turn on the faucet. We know it has to come from somewhere, but few take the time to really understand their water's origins. I was one of those people; I never thought about it. When I started to look into the topic, I became very concerned. The Triangle area of NC has a history of water quality issues. Even some waters located as close to a mile from the Environmental Protection Agency's state headquarters nearby, are impaired. Impaired waters are those that do not meet certain water quality standards set forth by the Federal Clean Water Act. The list of these water bodies is known as the 303(d) List. So just how much of the Triangle's water is impaired? All of the areas in red are on the 303(d) list. Impressive right? What's really alarming is those larger bodies of water North and West are drinking supplies for Raleigh and Durham. If the tributaries to our drinking supply are all impaired what does that really mean for the people drinking it? Sure water is treated before it comes out of your tap, but there is a greater issue here. I wonder what the states water situation will be in 10yrs especially with fracking on the table. For now I'll stick to water problems locally. One major problem facing our local water supplies is PCB, or polychlorinated biphenyl, contamination. PCBs were primarily used in coolant fluids in electric motors, but they were also found in some household products like floor finishes. North Carolina was the site for one of the largest PCB "spills" in the country. One summer in 1978, PCB-containing oil was deliberately sprayed along some 240 miles of NC highway shoulders in 14 counties. In fact, there is a major PCB "cleanup" area not 20 miles from my front door. I say "cleanup" loosely. The major contamination near my house originated from a power company that dumped PCB-contaminated waste into areas around Crabtree Creek. The company is long gone, but the effect still lingers, and it has spread throughout the whole watershed. There is still a debate over who should pay to clean up the spill. The EPA has said that it will not clean up the downstream. They will monitor Brier Creek Reservior, Lake Crabtree, and Lower Crabtree creek, but it does not plan to clean those waterways. There is an all too familiar sign posted on many of the streams and ponds in the area. If the water you drink and the fish you eat could possibly give you cancer, do you feel a mere sign is good enough warning? Should there not be more education about the effects and consequences of these spills? I think this should be bigger news and clean water should be a higher priority for everyone. We all have to drink this water, and we should all be aware if its source. Do you know where your water comes from? More importantly, do you know the quality of the source of your drinking water? Think about that the next time you turn on your faucet. Think about that the next time a stream cleanup day is advertised. I love reading articles about improving my fly fishing game. The site RandRflyfishing offers several articles. 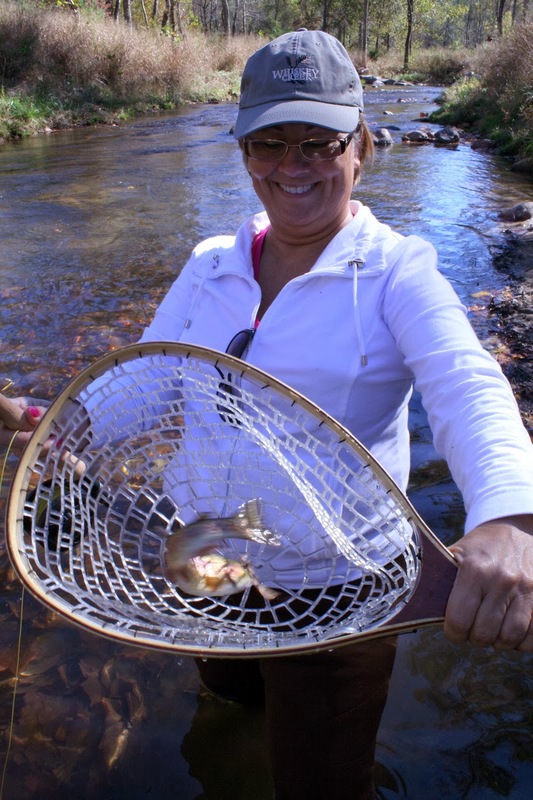 Catch More Trout: Treat Your Fly Rod As If It Were A Gun is one of my favorites. The main thing I love about these articles is the tips are easy to remember and explained well. That's such great advice and it's amazing how many of us don't follow this. I can't tell you how many times I've gotten lazy and just cast to spots because they were easy or there was water there. They probably weren't the best lies for trout and I was most likely spooking better water by casting in these areas. This seems obvious but many times when I see rising fish I get excited and cast into the mass of rises. I'm sure this spooks half the fish and I would be better off going for one of the rising fish. If you find these little tips helpful I recommend checking out the article on their site as well as several others they have. It really is a great resource. By far this year my most productive fly has been a beadhead softhackle. I've tied the body of mine using dubbing from Singlebarbed.biz. It gives the fly a more beefy look. I'm not sure if that's what is making the difference or if it's the extended hackle on the flies. The flies have worked each time I have gone out. The other color combo that is working is a red body. The flies work so well I haven't had a chance to experiment much with other color combinations. Yesterday I used these flies almost exclusively. I also worked on nymphing without using an indicator. This was difficult for me to try at first. I love indicators especially the thingamabobber style ones. Without an indicator you do have more control over the depth of your flies. If you have a high visible color line the takes are somewhat obvious. The main thing is having no slack line in the water. After missing a few hook sets I started to dial in what I was doing. It didn't take long before I had a trout slam. If you've never heard of this term it is when you catch a brown, brookie and rainbow all on the same river the same day. It doesn't happen as often as you'd think even on multiple fish days. The brookie had striking colors compared to the other fish. I'm guessing this was a male. When I'm fishing softhackles I usually look for the same kind of water. Ideal water is a fast run that turns into a riffle then settles down into a deep pool. I find most of my fish are where the riffle and deep pool meet. I caught the majority of my fish in a section like this and the highlight was hooking a really nice brookie. The picture doesn't do the fish justice but if you compare it to the brookie above which was around 14"-15" you can get an idea of the size of this fish. I couldn't put my hands around it to release it. I did a really klutzy release. I'm sure the fish was fine it was just a little embarrassing. This post is not a review or an onslaught against Chota. I'd just like to show how my boots have held up in the year and half I've owned them. I bought these boots in May 2012 mainly because of the recommendations from friends. The reputation was that the boots were very durable and will hold up for several years. I fish about 60-70 days a year. 95% or more of these trips involve wading. The other 5% involve fishing from shore or a boat. The first thing to go on the boots was the inner soles. After two trips the inner soles came unglued in both boots and started to slide around. It became such a nuisance I ripped the soles out. In about 8 months the lace on one of the boots started to come apart. Eventually it got so bad I had to replace the laces. Around the same time the leather on the front of the boots has slowly deteriorated. You can see overall the boots just look really bad in the front. The rest of the boot has held up pretty well. I was hoping to get a few years out of these boots and I think I can get at least one more. The felt still holds up really well and the part where the leather is splitting isn't so bad that the boot is physically coming apart. Ice skating wax laces have taken the place of original ones. You can get these fairly cheap, $5 at DicksSportingGoods. How long do your wading boots normally last? How long do you think they should last? I hit a delayed harvest stream and the afternoon started out how it usually does. Fish were stacked in their normal places and they'd hit your fly if the drift was just right. The fall always provides a challenge of figuring out the difference between an actual fish strike and your line hitting a drowned leaf. I caught almost as many leaves as I did fish today. The water was very cold and the fish strikes were very subtle. What made matters worse was a sizable leak in my waders. People were camping in many of the good holes. There was one that required waders to get to and fish it properly you had to stand in waste deep water. I tried to fight mild hypothermia and worked this spot for quite awhile. Then about as the last daylight was dying small bugs started to fill the air. They were scattered at first then became a flurry of insects. I could see several heads popping up at the beginning of the pool. Fish started to stack up and there were swirls and rises all over. It's rare you hit a real hatch in NC. I saw one of the bugs on the water and it looked to be a size 19 blue winged olive. I say size 19 because whenever there is a really good hatch it always seems like I don't have anything that matches the exact size of the insect. I decided to try a size 18 dark olive caddis. The sun was starting to set and I couldn't see my fly in the water. I always wondered how people could detect strikes on flies smaller than a size18. My buddy gave me the best advice ever. If you see a fish rise where you think your fly landed set the hook. This is really the only way to fish when you can't see the fly. It ended up working and I hooked a couple nice fish. Then the rises started to become less frequent. There was one fish that lifted it's head half out of the water. You could literally hear the CLOOP as it sucked in bugs. I tried to time the fishes rise. I thought I had the fish at one time but it either missed the fly or I pulled it out of the fishes mouth. The water went dead and I couldn't see any signs of fish rising. After a few minutes a warm breeze came across the river and the bugs started to appear in the air again. The head started to appear CLOOP! CLOOP! I cast ahead of where the fish was rising and said out loud "eat it, eat it eat it" then CLOOP! The fish ate the fly nonchalantly. I set the hook and the fish fought but stayed close to the surface. The short fight didn't match the size of the fish. Sometimes that's the case with stocked fish. The special thing for me about this fish was how it was caught. My fly selection and cast had to be just right to catch this fish and I was rewarded. It made the day for me. My family would always call the cold they got late in the year The Crud. I thought maybe I'd be lucky and avoid it altogether this year. Nope, it got me. It started with some post nasal drip action but now it's moving into my chest. It hasn't zapped my energy yet and I thank god for that. As I get older it seems like my ability to shrug off colds gets harder and harder. I haven't been fishing much even though the weather has been awesome. I did get out one weekend for a guided trip. It was my first time really guiding some newbies and I made several mistakes that I'll learn from for future trips. The first was that even if you go to a place where you know for 100% certainty there are fish that doesn't mean people will catch them. Just because you know how to catch fish in a certain area doesn't mean others can do so. It also doesn't mean you can teach others to do so either. What I really learned by this trip was that I fish a certain way. There are specific things I've done over a period of time that have now taught me a technique. Teaching this technique to someone else is almost impossible. They'd have to go back through the years and have the same trial and error I had. They'd also have to think the same way I do. So what do you do in situations like this? You have to get really generic and figure out what people can and can't do. Can they cast 15ft? Do they have line control and can they present a decent drift? Do they see the fish and understand what their fly is doing? Have they ever waded before? The list goes on and on. All of these are factors in success or being skunked. We fished two pools that had tons of fish in them. Who knows how many flies these fish had seen in just a few days. They still hadn't learned to be afraid of people and many of them had been caught at least once. My clients didn't have polarized glasses which made the day very interesting. I kept pointing out things and doing play by play of what the fish was doing which was pointless. Fishing without polarized glasses is almost like fishing blindfolded. You can do it and it may work now and then but it's not very effective. The second thing I learned is even if someone wants to use their own gear inspect it. Better yet rig it up yourself. We had talked about this trip a few weeks before going. Our club was giving away spools of tippet. I was asked what would be a good option for the trip. There was no 5x so I said you might want to grab some 6x. This wasn't the smartest suggestion. 6x is great for 10inch or smaller fish but if a good sized fish hits 6x just right it will snap it like a spiderweb. I watched this happen twice before I switched the 6x with 5x. Even with all the mistakes there was some success. This fish was caught after the first 20min on a beadhead soft hackle I tied. At the time I was proud of my fly tying skills as well as fishing tutelage. The next 3hrs however I was severely humbled. I was second guessing a lot of what I knew was right. I figured we should move but I was afraid to leave a place I knew had fish. The better decision would have been to find other water. These fish had seen plenty of fishermen. I also didn't take into consideration the expectations of my clients. They were the type of people you want to fish with. They didn't care about the fish. They were happy enough just being outside. It was a beautiful day. The trees helped by showing their fall colors. I decided to try fishing myself and I had several follows but couldn't entice a bite. We left the day with only one fish caught. I received several compliments about the day and requests to go again. I'll definitely handle things different the second time around.